This entry was posted in Books and tagged Emile Zola, French literature, Rougan Macquart, The Classics Club, The Classics Spin #19, The Earth by Katrina. Bookmark the permalink. Just when I was thinking, oh this sounds like King Lear, you make the connection too. Your comment about their stamina for under hedge assignations made me laugh! There seemed to be no end to their sexual energies, obviously the word ‘knackered’ wasn’t in their vocabulary! Wow, you can’t really pass it up at 50 cents, even if you do have loads of TBR books at home. I’ve only read one or two books by Zola, but I’ve always intended to read more. I have Germinal on my Classics Club list which I’m looking forward to, but most of them sound good! 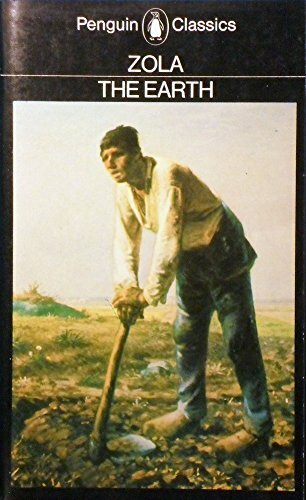 I really liked Germinal although it is quite a grim read. Luckily I don’t work so I have plenty of time for reading, especially in the winter when it’s too cold to garden. Thanks for dropping by. Good for you for seeking out another Zola. I’m wondering: Which of his books have you read, and which is (are) your favorite (s)? We’ve got over 3 feet of snow on the ground, but I am convinced that we will have an early “March” spring this year. Rarely happens–happened the first year we were here, but I think it will, based on a few observations about the polar vortex caving in within February. Germinal is my favourite so far, you should give it a go. Yes the snowdrops are out, they were early but the recent cold weather has stopped them so should prolong their season. It’s very cold here, hard frost and car windscreen scraping time, but we have no snow – unusually that is all down south, even in Cornwall. The Earth was one of the best Zolas, but wow, so many unpleasant characters! They were so awful, yet I could not stop reading. I’ve read about half the series, and so far my favorites were Germinal, La Bete Humaine, and Pot Bouille which is actually rather funny. I’ve also heard La Debacle is excellent but I haven’t tackled it yet. My favourite so far is Germinal but I really liked La Bete Humaine too. It was all the unpleasant characters that put me off The Earth, really Jean was the only person I would have wanted to have anything to do with. Germinal is my favourite of the 4 I’ve read so far too, although I have enjoyed them all in their own way for what they show me about life and times in Zola’s France (Nana, The Kill and The Fortune of the Rougons). I like the King Lear link too, Zola certainly had a Shakespearean tendency for high drama and tragedy. His books certainly do give a window into life in France back then, it was grim despite them having a revolution to improve things.